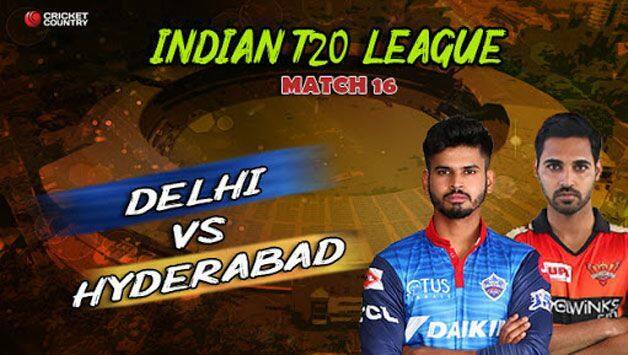 Welcome to our coverage of Match 16 of the Indian Premier League in which the Delhi Capitals host the in-form Sunrisers Hyderabad. 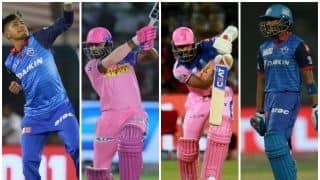 Can Delhi Capitals stop the in-form Sunrisers Hyderabad? And that’s the match. Mohammad Nabi finishes in style – a FOUR and a SIX as Sunrisers Hyderabad beat Delhi Capitals by FIVE wickets. A four towards midwicket and a cut over deep point sealed Sunrisers their hat-trick of wins. Delhi came back strong in the middle overs but the total was just not enough for the Capitals. What a game for Nabi though. 2 for 21 with the ball and now the winning runs. Tremendous stuff from the Sunrisers. End of Over 18: After a tidy start, Morris drifted down a short ball down leg which was pulled away past Rishabh Pant for a boundary. That should ease the pressure. Every dot ball is being cheered loudly at the Kotla by Delhi’s fans. Sunrisers 120 for 5. 10 needed off the final two overs. End of Over 17: Rabada comes back with a quick and fiery over. Just three runs off that over as the equation comes down to 16 off 18 balls. Who’d have thought of that with the way Bairstow had started off the innings. Delhi have come back admirably, but with some batting still left for Sunrisers, it may not be enough for the home team. End of Over 16: WICKET! Another one goes. That’s the third wicket Sunrisers have lost in the last four overs. Poor shot from Deepak Hooda to hole out to Rabada at midwicket. Lamichhane gets his first. Sunrisers 111 for 5. Is there a twist? End of Over 15: GOT HIM! Iyer won’t drop this one. 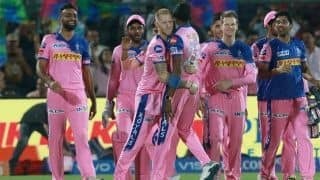 Delhi strike with another wicket as Vijay Shankar falls to Akshar Patel. Could that be the opening for Delhi. Sunrisers 103 for 4. End of Over 14: Oh dear! Sloppy from the Delhi Capitals. First, Tewatia sends down a terrible ball which gets dispatched for a FOUR. Next ball, skipper Shreyas Iyer of all people puts down an easy catch of Deepak Hooda at short cover. Can’t afford to put chances like that down when you’re defending 130. Shoddy cricket from the Capitals. Sunrisers 100 for 3, need another 30. End of Over 13: WICKET! Ishant Sharma strikes in his first over as Pandey hits the ball to Prithvi Shaw at deep square leg. First signs of Ishant but such as been the surface that fast bowlers’ role is limited. Pandey is disappointed, Ishant won’t be mind though as Sunrisers lose their third wicket for 95. End of Over 12: Sunrisers 90 for 2. Just three off that over from Tewatia, including a wide. End of Over 11: Sunrisers 87 for 2 as Manish Pandey and Vijay Shankar continue to go nicely about this chase. No flashy stuff, just milking the singles and getting the off boundary. Sensible batting this from them. End of Over 10: Vijay Shankar has been such an improved batsman since India’s tour of New Zealand earlier this year. Takes Morris on and sends him over cover for his first boundary. Sunrisers 81 for 2, need another 49 to win. Unless they make a mess of this, they should get home rather comfortably. End of Over 9: Sunrisers 72 for 2. Disciplined third over from Lamichhane. Just 4 off it. Sunrisers’ middle order has not been tested yet, and with another 60 odd runs to go, Delhi promise to come hard at them. End of Over 8: GONE! Warner hits Rabada straight to Morris at mid-off. A strange innings from Warner comes to an end. He falls for 10 off 18 balls. Sunrisers lose two wickets in quick time. Can Delhi make something of this? Sunrisers 68 for 2. End of Over 7: OUT! And it’s the big wicket of Bairstow which Sunrisers lose. Rahul Tewatia provides the much-needed breakthrough for Delhi. Big LBW shout and the umpire was quick to put the finger up. As was Bairstow, who probably believes there was an inside edge. However, the snicko showed no disturbance, which meant that Bairstow had to depart for 48. Entertaining knock from him. Sunrisers 64 for 1. End of Over 6: Another fabulous over for the Sunrisers. 14 off it as they reach 62 without loss at the end of the Powerplay. Bairstow is on a rampage, taking Kagiso Rabada for three boundaries in that over – a cover drive, a thunderous strike down the ground and an edge that flew between the keeper and first slip. The rate at which he’s going, this game may not last long. Sunrisers need another 68 off 84. End of Over 5: Sunrisers 48 for 0 and cruising along at the moment. Two more boundaries off that over from Axar – a bye and a Jonny Bairstow aerial strike down the ground. End of Over 4: Bairstow turning on the heat. Four boundaries off the over from Chris Morris – three off the bat and one leg bye. The two dot balls in that over was a yorker and one that fell short of a diving Rabada at mid-on. Terrific start from Sunrisers to reach 36 without loss. End of Over 3: 13 off it, a good one for Sunrisers. Jonny Bairstow begins the over with a crunching SIX off the first ball and follows it up with a boundary off a googly. Furthermore, Delhi also lose their review after Lamichhane decides to go upstairs for an ambitious LBW call. Sunrisers 20 for 0. End of Over 2: A chance out down by Axar Patel off his second delivery. Bairstow hit the ball but Axar spilled a relatively easy chance. After looking in some trouble, he got back up to delivery a good, tidy over. Just a single. 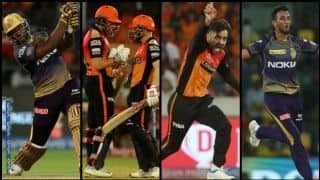 Sunrisers 7 without loss. End of Over 1: Sunrisers 6 without loss. 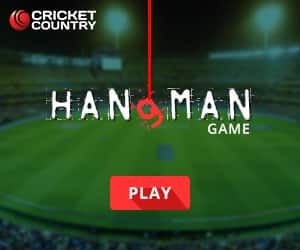 David Warner tried to unsettle Sandeep Lamichhane first ball with a reverse sweep but didn’t quite connect. Bairstow however picked up Lamichhane’s googly and sent it past short fine leg for Sunrisers’ first boundary. The first innings has belonged to the Sunrisers. Barring those couple of boundaries in the first over, they tied Delhi down. Shreyas Iyer tried defiantly with 43 but running out of partners didn’t help him. Sunrisers bowlers kept chipping away with, Bhuvneshwar, Nabi and Siddharth Kaul picking up two wickets each. End of Over 20: Two sixes from Axar Patel in that last over pushes Delhi Capitals to 129 for 8. He remains unbeaten on 23 off 13 to give Delhi something to defend. Have they got enough though? End of Over 19: Delhi slump further as Morris departs, giving Bhuvneshwar his second wicket. The Sunrisers skipper could have easily gotten a third had Sandeep Sharma hung on to a simple catch of Rabada at midwicket. Axar finishes the over with a boundary. Delhi 115 for 7 with one over left. Can they get to 130? End of Over 18: SIX! Morris goes big and gets Delhi Capitals just their second six of the innings. The 100 comes up for them. It hasn’t been easy for them but Morris is their last hope. He was out for a DUCK the previous match and here is his chance to redeem the innings later. Axar Patel struggling at the other end scoring 3 off 5. 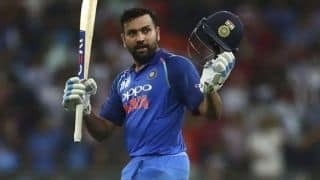 Delhi 105 for 6. End of Over 17: Knocked him over! A wrong one from Rashid Khan, Iyer misses his sweep and Delhi have lost a big wicket here. He was looking to bat till the end, but having played so well for 43, the skipper has to depart. Delhi 97 for 6. End of Over 15: A much-needed boundary from Iyer in Rashid Khan’s third over. All eyes on him to get the Capitals to a decent total. Delhi 85 for 5; five overs remain. End of Over 14: OUT! Another one goes. A screamer from Manish Pandey at point sends back Colin Ingram as he holds on to a fierce cut shot from the batsman. Delhi in a rut at 80 for 5. Pandey had almost run Ingram out first ball but missed his aim by a whisker. Meanwhile, Chris Morris, the last recognized batsman for Delhi, is off the mark with a boundary. End of Over 13: A boundary there from Shreyas Iyer but Delhi still continue to crawl at a scoring rate of under 6. Length ball from Sandeep gave Iyer, running out of partners, the opportunity to wade him towards midwicket for a BOUNDARY. Delhi 72 for 4. End of Over 12: Fantastic over from Rashid, getting into his elements. Just four off that over; Delhi 65 for 4, and in urgent need of a move on. End of Over 11: Another wicket! A knuckle ball from Sandeep Sharma foxes Rahul Tewatia who lobs the ball to Nabi. Delhi 61 for 4. Delhi needed more from Tewatia, especially after that previous boundary he hit. Perhaps the shot of the evening so far. Good length delivery from Sandeep Sharma but Tewatia was quick to get onto the backfoot and punch it through the covers. And the timing on that ball was right in the center of that GREEN bar in those cricket games. None the less, he’s gone and Delhi find themselves in a spot. End of Over 10: WICKET! Delhi 56 for 3. How many times have we seen this happen? A break that results into a wicket. And it’s happened again. First ball after the time out and Rishabh Pant holes out at long-off. Nabi flights the ball from round the wicket and Pant goes inside out. Unfortunately for him, the ball doesn’t clear the boundary and Deepak Hooda takes it at long-off. Nabi finishes with splendid figures of 2 for 21. Could have been 3 for 21 had his LBW shout off the last ball been upheld. Nabi went upstairs and the ball seemed to be hitting leg stump. But since the original decision was NOT OUT, Tewatia stays. End of Over 9: Another bowling change from Sunrisers. Sandeep Sharma given the ball and the medium pacer starts off well. Just five off that over. This is the depth Sunrisers have in the bowling. Delhi 52 for 2. End of Over 8: Rashid Khan starts off with a loosener. A low, full toss. Just what Iyer and Delhi needed. Full and quick outside off the the Delhi skipper smashes it through the covers. Iyer is too good a batsman to miss out on that. Rashid fixed him three balls later outside off but pushes for two to take Delhi to 47 for 2. End of Over 7: Delhi 41 for 2 after five singles were taken off Siddharth Kaul’s second. Iyer and Rishabh Pant getting their eyes in. End of Over 6: GONE! One sweep shot too many from Shikhar Dhawan. After sweeping the first ball emphatically for a boundary, he top edges the final delivery off that over to Sandeep Sharma at short fine leg. Too wide to sweep as Nabi gets his first wicket. Delhi 36 for 2. About the first sweep shot, it was the first real sign of intent show by Dhawan. He had tried the sweep off Nabi a couple of time earlier but on this occasion was finally able to out some force behind it and got his first boundary. It was angling in and Dhawan got completely in control of the shot. Wasn’t to lucky the second time around though. End of Over 5: Iyer goes big and that clears the ropes. Delhi finally get going it seems. Full fro, Siddharth Kaul and Iyer went wide of long-on. Tremendous shot from the Delhi skipper to take the total to 27 for 1. End of Over 3: GONE! Bhuvneshwar gets his man. Length, straight and TIMBER! Two dot balls, and Shaw went for the mighty heave across the line as the off-stump goes for a swing. Bhuvneshwar on the money as he gives away just a single. Delhi 15 for 1. End of Over 2: Delhi 14 without loss. Good start from Mohammad Nabi, keeps Shaw and Shikhar Dhawan to taking six singles in the over. Tidy as expected from the Afghanistan spinner. He finished with 4 for 11 in the previous game against RCB. On a dry Kotla deck, what can he conjure? End of Over 1: Two boundaries off the first over. Delhi 8 without loss. First ball of the match, and inswinger and Prithvi Shaw rocks back onto the backfoot for a boundary off the first ball. The penultimate ball took the edge and with no slip in place, went racing for a second. Good start from Delhi. Alright then! Early treat for the fans at the Kotla as they get ready to see their favourite team bat. As the players get ready to come out and get the action underway, click here to find out what you can expect in the next four hours. 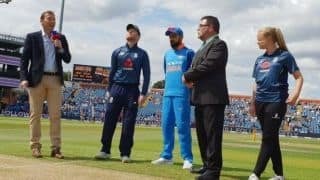 Bhuvneshwar Kumar: We are going to bowl first. It’s a dry wicket but keeping the way we’ve batted in the last few games, we want to chase. We’re unchanged. Shreyas Iyer: We would have bowled first as well, irrespective of what happened the other night. Looks a dry surface and it might spin more in the second half. So, banking on that. 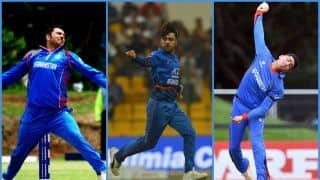 Three changes – Ishant, Axar and Tewatia come in. TOSS: Unchanged Sunrisers Hyderabad win toss and opt to BOWL against Delhi Capitals at the Kolta after Bhuvneshwar Kumar wins toss. Three changes for Delhi as Ishant Sharma, Rahul Tewatia and Axar Patel come in. Hello everyone. 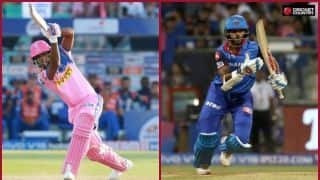 A warm welcome to our readers for CricketCountry‘s coverage of Match 16 of the Indian Premier League in which the Delhi Capitals host the in-form Sunrisers Hyderabad. Both teams are level on four points, but Hyderabad are ahead having played one game fewer. 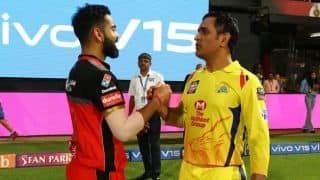 There cannot be a better example of the fickle nature of Indian Premier League than the change of fortunes Delhi Capitals and Sunrisers Hyderabad have undergone inside two weeks of the competition. While Delhi started the season with a dominating win, Hyderabad lost their way in the final overs to start with a defeat. Since then, the 2016 champions have improved bit-by-bit to post consecutive wins while Delhi have realised, they have serious batting issues to address if they wish to harbour playoff hopes.